Then that begs the question; why do we stand for sloppy presentation when buying clothes online? You see, internet shopping, in many cases, is just the same as being given a mushy steak. 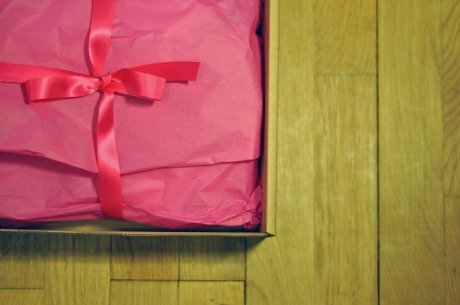 We order something beautiful but it plops onto our doorsteps looking ugly: Folded round bits of crinkled tissue paper, suffocated by plastic wrap and a dusty, grey postage bag (or worse – an over-taped box, stuffed full of bubble wrap). Two issues are brought to light with this. Firstly, as all you Good Wardrobers know, clothes are an investment. They will be part of a shopper’s life for some time. So surely their presentation should reflect the fact that they will be loved and cherished. Secondly, and more urgently, packaging should be sourced carefully so as not pollute in the way it currently does. In 2010 the UK disposed of an estimated 10.8 million tonnes of packaging waste and 33% of that went to landfill. * Of course the products we buy need to be protected but this should never be to the detriment of our environment. After all, what’s more important, a snazzy new jumper or this incredible blue-green space-marble our children will inherit? Unfortunately, the waste doesn’t stop with online shopping. A while back I bought some pants from La Senza. At the checkout, my knickers were wrapped in four layers of tissue fastened with three stickers, put into a paper bag, sprinkled with half a ton of over-perfumed plastic hearts, and the bag fastened with another sticker. For three pairs of keks. 20 minutes later I was at home and all but the pants and bag were rendered useless. There is nothing wrong with using a single piece of pretty, unbranded ribbon to keep something folded. In fact, there is a lot right - the ribbon can be used again and again, and it looks a lot more lovely than a taped-up bag. There is also a lot right with closing the loop and wrapping clothes in recycled paper. It’s also good to know that some large companies are looking in depth at their packaging too. 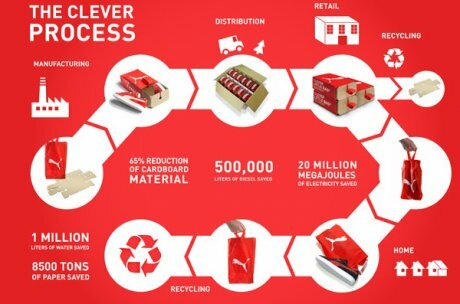 Puma realised that, although its shoe boxes were recyclable, “Our lives are filled with them”. It took this idea with its trainers in mind and ran with it. By niftily fashioning its Clever Little Bag shoe boxes out of reusable bags, the sportswear brand expects to save 20m megajoules of electricity, 1 million litres of water and 500,000 litres of diesel per year, and use a whopping 65% less paper. Less is most definitely more when it comes to packaging – and that is something that clearly involves thought. Next time you order a snazzy new jumper, if it isn’t wrapped like the investment it is, kick up a fuss. Do like you would with your steak and tell the company it’s not good enough. Demand that your clothes be beautifully and sustainably presented. After all, why have Brisket when you can have Rump? WANT TO DO SOMETHING ABOUT PACKAGING? Ellie Good is the Founding Editor of EggMag, the online magazine that joins culture with a conscience. She is a big fan of second-hand bags, Scandinavian textile design and wearing the odd moustache.